Beneath the refined, contemporary exterior lies a level of technical sophistication unique to Clearaudio. The Concept's chassis comprises a core of natural medium-density wood fibre within an aluminium surround and upper layer incorporating a high tech synthetic compound. This composite of materials eliminates the detrimental effects caused by unwanted vibrations. The DC motor is fed by an external voltage-stabilised power supply and is completely decoupled from the chassis, isolating the record from any mechanical interference. The Concept tonearm features a magnetic bearing that is friction-free for extremely low distortion and superb performance. The package is completed with the high-quality Clearaudio Concept cartridge. With the Concept turntable package, Clearaudio offers you an extremely innovative design that is very affordable. 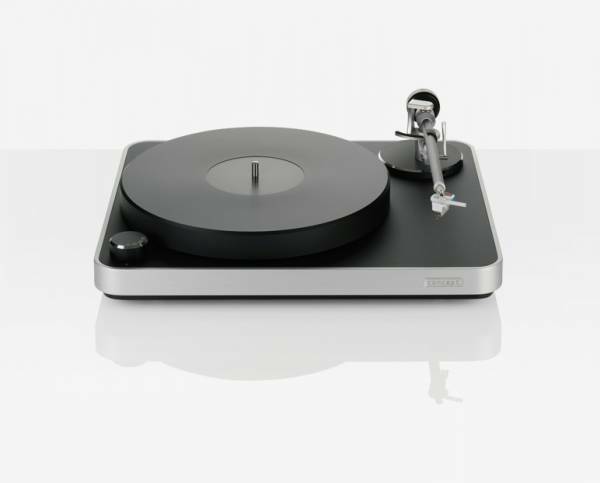 The revolutionary Concept combines the highest quality of music playback with a design that has won several awards worldwide – including the German Design Award and 'Best Turntable' award from 'What Hi-Fi? Sound and Vision' magazine. With the Concept, to find an affordable entry point to the high-end world is a breeze. It reveals the magic of optimum sound reproduction even for those music lovers who could not previously afford this experience. You can buy the Concept in a package with specially developed moving magnet (MM) or moving coil (MC) cartridges. A frictionless magnetic bearing tonearm is responsible for the optimal performance of the cartridges. All critical parameters from cartridge tracking weight to anti-skating are preadjusted in our factory. The Concept represents the ideal of stress-free 'plug and play': unpack, connect, put the record on the platter – and just enjoy music. There was never more audiophile technology in this class of turntables. Related links to "Clearaudio Plattenspieler inkl. Concept Tonarm und Concept MM / Concept MC Tonabnehmer"
Customer evaluation for "Clearaudio Plattenspieler inkl. Concept Tonarm und Concept MM / Concept MC Tonabnehmer"